After more than forty years of planning decisions and open space acquisition, it is clear that Boulder will not be sprawling outwards – the external boundaries of Boulder are largely set, both by intergovernmental agreement with the county and by purchase of open space. The significant decisions going forward will be about the nature of the community within these existing boundaries. The values that are shared by our community are well articulated in the Boulder Valley Comprehensive Plan – values like environmental stewardship and climate action, a vibrant economy, a diversity of housing options, a culture of creativity and innovation, and a transportation system that makes it easy to get around without a car. The Comp Plan describes a desire to evolve towards a sustainable urban form. 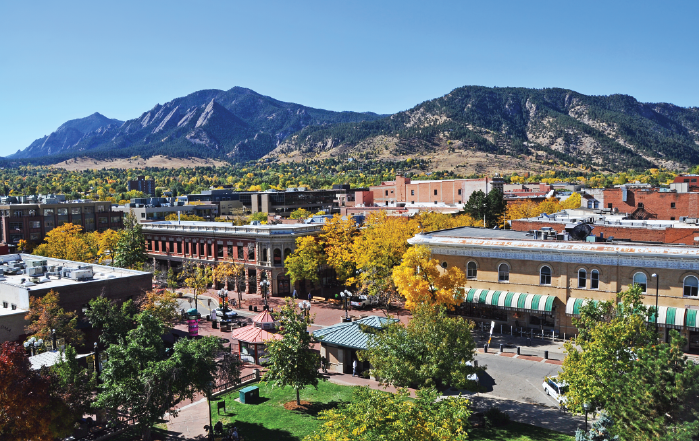 Better Boulder strongly supports these goals, and believes that in order to achieve these goals Boulder will need to evolve towards a denser land use pattern. Some have argued that the way to achieve community goals is to oppose growth, and try to preserve Boulder as it once was. We disagree. We do not need to grow outwards, but we do need to evolve towards a more urban fabric. Well designed density can both help to meet broad community goals, and improve our quality of life in multiple ways. From an environmental perspective, denser development can significantly reduce energy use and greenhouse gas emissions, both from buildings and transportation. Sustainable urbanism allows more people to live near where they work, to walk and bike for more of their trips, and to take transit. Data from the City of Boulder show that people who live in Boulder drive about half as much as the regional average. When we build new housing in Boulder, most of it is smaller, and is townhomes, condominiums or apartments – all of which use far less energy than single-family homes. All told, national studies suggest that this type of development will use half the energy of suburban living. And, combined with the higher energy standards Boulder requires for buildings, per capita energy use could be even lower. Our quality of life will also improve, as denser development gives all of us more choices in our daily lives. Most of us would like to have more places to work, eat, shop, or play close to our homes and schools and workplaces. We can only achieve this when there are enough residents and employees to make it economically feasible. Density also makes it economically feasible to provide beautiful public facilities, and provides more opportunity for creative and artistic ventures. A greater variety of more urban neighborhoods will offer choices for the young, and for our elders who wish to stay in Boulder as they age.